Character design is essential to Overwatch's evolving appeal. This article was originally published in PC Gamer issue 322. For more quality articles about all things PC gaming, you can subscribe now in the UK and the US. Many of Overwatch’s hero balancing updates have been welcomed, but there are a few that recall Sirlin’s example of the huge rock guy with hardly any hit points. Part of the problem here is that balance is not some objective truth to be pursued. It arises from how developers define skill and success to players, and the expectations about the validity of certain approaches those players bring with them, based on their exposure to other games. Balancing a game thus helps shape who the game appears to be for, whose criteria of skill takes precedence, It’s a conceptual tug-of-war that extends from the development team and playerbase into the realms of people who might pick up or return to the game if certain changes are made. Overwatch’s breadth of styles has created many conflicting interpretations of ‘skill’. Its balancing updates thus tap into the heart of broader underlying ideological differences within the PvP community. In particular, the game has been both praised and slammed for how it diverges from a narrower vision of the FPS as being primarily about accuracy and manual dexterity. That consideration hinges on the presence of heroes with autoaiming weapons or whose role isn’t really built around kills. These characters are often branded ‘low skill’ by traditionalists who express prowess in terms of streaks and headshots, but others love them precisely for how they transcend that concept of the shooter, while making Overwatch more accessible to players with disabilities who might struggle to aim a cursor. Recent reworks suggest, however, that Blizzard is giving ground to that older notion of a shooter, potentially alienating portions of its audience as it manages what has become a flourishing esport. Take Symmetra, the builder/DPS hero whose now-retired ‘2.0’ skillset was derided as underpowered, overpowered or simply a headache to play around. Armed with deployable turrets, a flying barrier, an autoaiming gun with manual secondary fire and the choice of a teleporter or shield generator as her ultimate ability, the older Symmetra certainly took some unravelling. But master rank Symmetra main Togrias argues that she was valuable precisely because she was so ambiguous, able to perform many roles at once—placing turrets to catch out infiltrators when holding a point, for example, or using her flying shield to lead the charge on a position. Her choice of ultimates helped “change the flow of the game and add variety to an otherwise stale meta”, he says, as opposing teams had to decide whether to sabotage the ultimate itself or deal with its effects. The new Symmetra, by contrast, is a more inflexible, “flashy” creation, her ultimates swapped for a gigantic temporary shield, her teleporter now a short-ranged regular ability, her autoaim discarded—the result being a hero geared towards duels and DPS. If Symmetra’s rework makes visible the competing demands on Overwatch, the conflict’s patient zero is probably Mercy, the support hero who can buff or heal allies with her autoaiming staff. If Symmetra’s rework makes visible the competing demands on Overwatch, the conflict’s patient zero is probably Mercy, the support hero who can buff or heal allies with her autoaiming staff. The character was controversial during Overwatch’s first year for her original ultimate, Resurrection, which let her revive an entire team at once and so flip matches in their closing seconds. Mercy’s ultimate was resented because according to some, it allowed ‘talentless’ players to ‘cheat’ their opponents of the rewards of precision shooting or the timely triggering of damage-dealing ultimates like Hanzo’s Dragonstrike. Much tuning later, Blizzard has demoted Resurrection to a regular ability that can only be used on a single target, while handing Mercy a new ultimate, Valkyrie, which supercharges her basic abilities. The result is that Mercy is more about shoring up her team than turning the tide, and players are divided over the changes. The controversy around Mercy’s skill threshold and her reworks is shaded, moreover, by the question of sexism. Judged in terms of representation, Overwatch has made many missteps: its female characters tend to be in line with stereotypes of beauty, while male characters are given more leeway in terms of age and body shape. But it is notable nonetheless for its gender-diverse roster, which appears to have attracted more women to the game: according to a July 2017 report from Quantic Foundry, Overwatch boasts around twice the average proportion of female players for a first-person shooter. This has, in turn, made Overwatch a target for outrage about ‘politically correct’ representation—and Mercy’s design is a place where this dovetails with conversations about what constitutes ‘the right way to play’. For Nico Deyo, media critic and host of the Make it Sound Fiction podcast, Blizzard’s replacing of Resurrection with Valkyrie is less about balance and more appeasing those who view support roles generally as the province of women. Deyo argues that the view that accuracy is paramount often goes hand in hand with the stereotype that female players are inherently less able than men, fit only to play support characters in a perpetuation of the cliché of woman-as-caregiver. Hence the complaints from some male players when a female support is deemed to have too great an impact. One way of working around louder, kill-oriented and more prejudiced players could be to actively champion heroes with abilities that go against the grain for shooters. Togrias points to the Specialist category in Overwatch’s MOBA stablemate Heroes of the Storm, used for wildcard characters who are cherished because they don’t fit in. 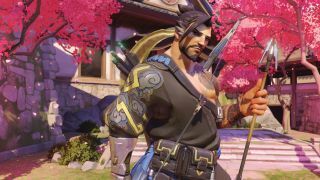 Deyo feels, however, that Blizzard is comfortable with Overwatch’s current direction, and that the game’s engrossing breadth will only continue to narrow.